According to a survey from Shelter, 12% of Scots were struggling to pay for their home. 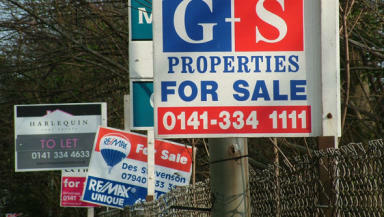 Struggle: Some Scots can't afford their own homes. The number of people in Scotland who are struggling to pay for their home has increased by nearly a third in the last two years, according to a study. Research by YouGov, on behalf of Shelter Scotland, indicated that 12% of a sample size of 600 people said they were currently struggling to pay their rent or mortgage costs. The figure is an increase on the 9% of respondents from two years ago when the same survey was conducted. YouGov suggest that the 12% figure is equivalent to nearly 200,000 households in Scotland. As many as four in ten respondents said that they would struggle to pay their rent or mortgage if it rose by as little as £50 a month during 2019. While 39% of those polled admitted they had at borrowed money from a friend at least once, used a credit card or used their savings to pay their rent or mortgage. Shelter Scotland has warned that ignoring money worries rather than seeking advice could lead to people's homes being put at risk. According to the charity, one household every 18 minutes was made homeless in Scotland last year, with nearly 11,000 households forced to live in temporary accommodation - including more than 14,000 children. Graeme Brown, director of Shelter Scotland, said: "It's quite clear from these numbers that tens of thousands of people in Scotland are entering 2019 worrying about meeting the costs of their rent or mortgage over the next few months and that many thousands more would struggle with even a modest rise on those costs. "A perfect storm of austerity, harsh welfare reforms, stagnant wages, job insecurity and the high cost of housing are making it harder for people to make ends meet and plan for the future. "It's a disgrace that in 21st century Scotland so many people should have to worry about the basic right of keeping a roof over their heads." Mr Brown also said that Shelter advisers are available to help anyone worried about paying for their housing costs, at risk of homelessness or struggling with bad housing. "It's absolutely vital that people who do find themselves struggling to make ends meet and keep a roof over their heads should seek help sooner rather than later," he said. "It's much better to put a plan in place to deal with debt and arrears in the early stages rather than wait for eviction notices and court orders. "All year round our teams are ready to help, but, in order to do so, we need help from the public so we can keep up our fight against bad housing and homelessness."